One of the things Jamie and I were looking forward to for our trip to Baltimore last month, was the abundance of fresh seafood to be had. Since Baltimore is right on a harbor, we knew the seafood would be fresh, fresh, fresh. Jamie's parents were there, too, so between the four of us, we were able to sample a little of everything. We ate raw oysters on the half shell twice, sprinkled with lemon and horseradish. We ripped apart a table full of snow crabs, pulling out the meat and making a general mess. We peeled shrimp, flavorful with Cajun spices. We sampled spicy seafood ceviche with squid, scallops, crab and avocado. At the Water Taxi dock next to Fort McHenry, we peered into the murky water and saw dozens of blue crabs clinging to the wooden posts under the water. Tiny mussels studded the posts at the water line. For our last meal in town, we ate at the Rusty Scrupper and shared more oysters and some lightly seared ahi tuna with wasabi, then Jamie ordered broiled rock fish and I ordered mussels, steamed with a savory marinara sauce. I had been craving mussels all weekend, and they were so much better than I had hoped. On the last day, we squeezed in a quick trip down to D.C. - neither of us had ever been there - so we drove down and spent three hours walking to the White House, the Washington Monument and the Lincoln Memorial before we were out of time and had to drive back to the Baltimore airport for the flight back to Denver. As if we hadn't had enough seafood, we grabbed a quick lunch at the airport - which I insisted on packing up in to-go boxes to eat at the gate since our flight was scheduled to leave in 25 minutes, but then ended up being delayed by 40 minutes. Crab cakes for Jamie and a crab and shrimp sandwich for me. We arrived home, our feet hot and tired. And after all we'd sampled, I still wanted more seafood, as well as a light and healthy dinner that we wouldn't have to make ourselves. So I ordered sushi, which our sushi restaurant in town delivers, and we satiated our seafood craving with salmon, tuna, yellow tail and squid sashimi, a spider roll and a spicy tuna roll. That was it. We'd finally had enough, and when I went grocery shopping the next day for the week, I made sure not to put fish on the menu. Normally, our weekly dinner menu includes one night each of chicken, beef, shrimp and fish, and shrimp is always one of my favorites since it cooks so quickly. We love it in shrimp tacos or tossed with pasta or in a spicy coconut curry sauce with rice. 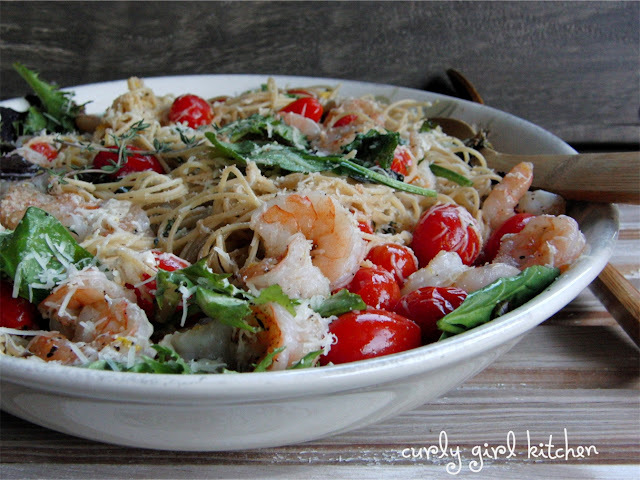 For this pasta dish, I simply roasted the shrimp on a sheet pan with some cherry tomatoes, seasoned humbly with olive oil, salt, pepper and thyme. Tossed with spaghetti, egg yolks for a little richness, fresh greens, lemon, Parmesan cheese and more thyme, it was a delicious meal for being so deceptively easy to prepare. 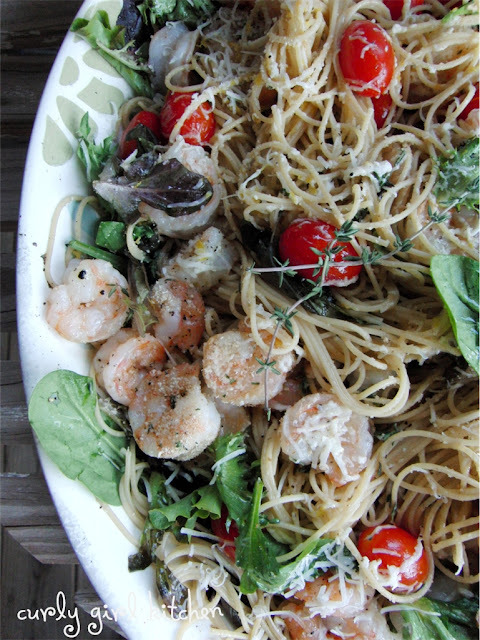 When I'm ready to eat seafood again, this dish will be making frequent appearances on the dinner menu rotation. Preheat the oven to 400. Meanwhile, bring a pot of salted water to a boil. 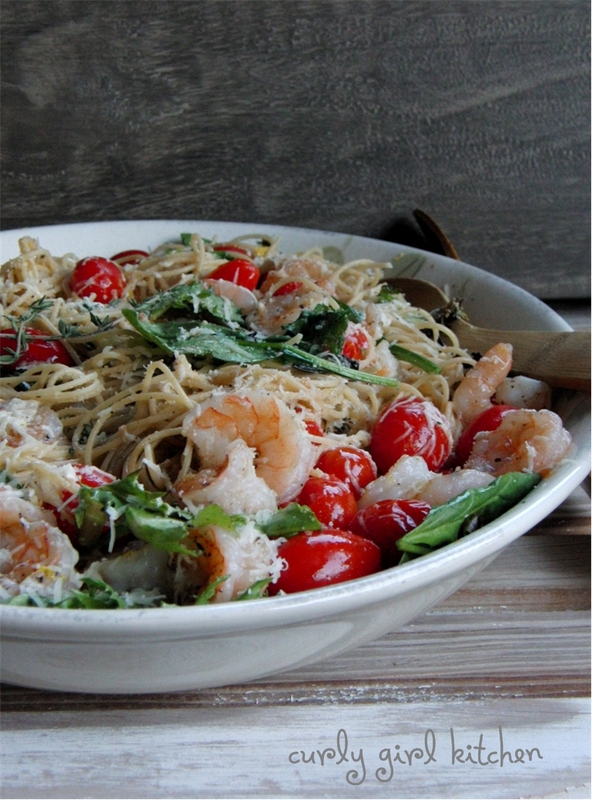 Place the shrimp and tomatoes in a single layer on a baking sheet. Drizzle with 2 tablespoons olive oil and sprinkle with salt and pepper. Scatter a few thyme sprigs over the shrimp and tomatoes. When the oven and the water are ready, set the baking sheet in the oven and drop the pasta in the water. Both should take approximately 7-8 minutes. Scatter the greens over a large platter. When the pasta is cooked al dente, drain all but 1/4 cup of the water. Scoop the pasta and the 1/4 cup water over the greens. Drizzle with the beaten egg yolks and the remaining 2 tablespoons olive oil. Season with salt and pepper, then toss to combine with the greens so the greens wilt slightly and the pasta is lightly coated in the egg yolk and oil. 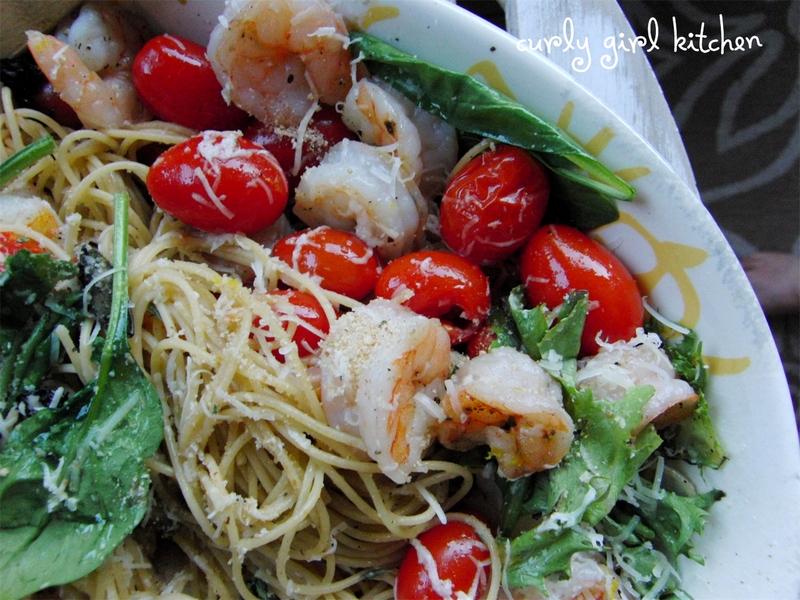 The shrimp should be pink and the tomatoes warm through, but not burst. Scrape the roasted shrimp and tomatoes over the pasta. Sprinkle a little more thyme, the lemon zest and juice, Parmesan cheese and Italian breadcrumbs. Toss once more, then serve.